At Corporate Realty, we continually strive for excellence and innovation, to provide great customer service, and to give back to the communities in which we live and work. While the nuts and bolts of what we do is help people and companies with their commercial real estate needs, our larger role, and one which we take seriously is to be productive and giving members of society. With this in mind, we hope you will enjoy this year’s monthly mailers. We will continue to post an overview of our transactions and new assignments every month along with observations from Ella Brennan and interviews and recipes from several of the world-class chefs who have come through the Ella Brennan/Commander’s Palace kitchen. 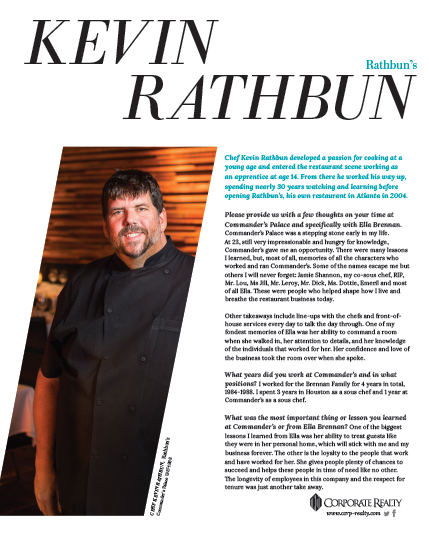 This past month we featured an interview with Kevin Rathbun, and his recipe for Lamb Scalloppini with White Balsamic Butter, Pancetta and Aged Goat Cheese. Read the interview, and recipe, on our website here.